The former co-host of Good Morning America is now an inventor with a childcare product on store shelves, but the wonder mom confronted a steep learning curve. 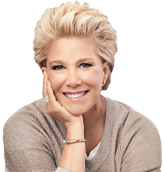 Joan Lunden is known to take risks. Television personality Joan Lunden remembers Saturday mornings as a child, when her mom would send her out to play until lunchtime. Today, she says, "we live in a very different time. Most parents would never dream of giving their children that kind of leeway." Me Time: A Pursuit of Passion! You are looking at a girl that is hard to lose. Our family recently visited Disneyland while we visited family in Southern California. Our daughter Ashlyn was well equipped for the day. On her right arm she had a KinderKord, a retractable cord attachment that could connect to the one on my wrist, giving her freedom with limits as she walked by my side. Add "inventor" to Joan Lunden's resume. The broadcaster, author, speaker and spokeswoman - along with her husband, Jeff Konigsberg - has developed an alternative way to tether parents to wandering toddlers. Among the new thrills to be unveiled at the International Association of Amusement Parks and Attractions annual expo, opening Tuesday in Orlando, are rides that simulate surfing without water and enable downhill tubing without snow. One of America's favorite moms is on a nationwide crusade to promote something that might prevent a family tragedy. Contact 13's Tricia Kean talked with former Good Morning America co-host Joan Lunden. She is an inspiration to women everywhere.